September 8, 2015 - United Airlines' chairman and CEO, Jeff Smisek has stepped down and has been replaced by Oscar Munoz. 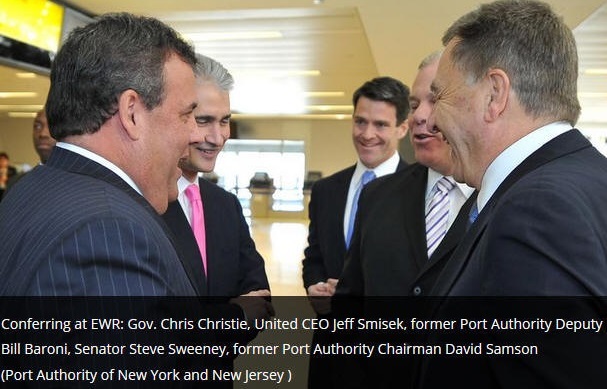 Smisek was replaced due to an ongoing investigation into United Airlines' dealing with the Port Authority of New York and New Jersey's former chairman David Samson. Back in August 2013, Bridget Anne Kelly, deputy chief of staff to Gov. Chris Christie sent an email to a Christie appointee at the Port Authority David Wildstein. "Time for some traffic problems in Fort Lee." Wildstein emails Kelly back, "Got it." On September 9th, Wildstein emails Kelly back to state, two of three access lanes to the George Washington Bridge are closed, causing traffic chaos, especially in Fort Lee. On the following day Fort Lee Mayor Mark Sokolich contacts deputy executive director of the Port Authority Bill Baroni to inform him of the traffic jams over the past two days, he further states the kids can't get to school. Wildstein was informed of Sokolich concerns and texts a Christie operative to state, "They are the children of Buono voters." Referring to Barbara Buono a democrat who ran against Governor Christie. As a result the state legislators began an investigation. 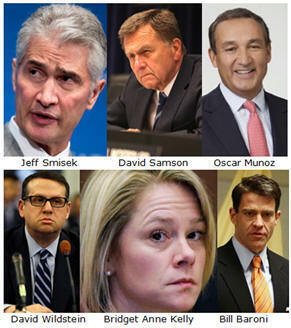 Samson, who has been a longtime friend of Governor Chris Christie, former state attorney general in New Jersey, headed Christie's transition team and was appointed chairman of the Port Authority by Christie in in 2011, was also implicated in the Christie bridge scandal and as a result Samson resigned from the Port Authority. It soon became clear that there were illegal activities taking place in the governor's office as well at the port. The Department of Justice and New Jersey state senate began investigations and a number of subpoenas were issued. Prosecutors this week issued a new subpoena to the Port Authority to get more information into the relationship between Samson and Smisek and have a better understanding as to why United Airlines began low demand flights between Newark and Columbia, S.C. It appears the Department of Justice is looking into the possibilities that there may have been a quid pro quo arrangement between Samson and Smisek and whether Samson abused his position at the port by influencing Smisek to offer flights between September 2012 to April 2014 in exchange for lowering United Airlines flight fees at the port authority. Samson's weekend retreat home is about 50 miles from Columbia, S.C.
Three days after Samson resigned from the port United Airlines discontinued these flights. DOJ is also looking into if there is any connection between United Airlines campaign contributions to Christie's reelection and the abuse of power at the port authority. United Airlines released a press statement and in part stated "The company also announced that its executive vice president of communications and government affairs (Nene Foxhall) and its senior vice president of corporate and government affairs (Mark Anderson) have stepped down. Airlines for America (A4A) today also announces it's new Board Chairman after Smisek stepped down. Doug Parker, chairman and CEO of American Airlines, will become their new chairman. Airlines for America is a lobbying organization that advocates on behalf airline executives. “We thank Jeff for his years of service to the industry and its trade association and appreciate his insight and leadership as chairman of the A4A board”. United Airlines Machinists Union General Vice President, Sito Pantoja said, “We look forward to working with new CEO Oscar Munoz, who we hope will respect the good people at United and provided them the tools to put their airline back on top. The dedicated, hard-working employees at United deserve better than the questionable leadership Jeff Smisek provided...... Under Smisek's five-year tenure at United's helm, the carrier has consistently lagged industry peers in operational and financial performance and has posted dismal customer satisfaction ratings." Smisek will receive a separation payment in the amount of $4,875,000, tax benefits and flight benefits, set forth in a Separation Agreement filed today. Smisek will remain eligible for a pro-rated bonus, he will keep his health insurance until his is eligible for Medicare, and he will keep his flight benefits, his company car and parking privileges for the remainder of his lifetime. United Continental's shares fell 2.8 percent in trading after the closing bell on the New York Stock Exchange.